Manchester Airport Runway Park was our destination on an icy winter afternoon with tickets booked for a tour of Concorde. Son had heard of the supersonic beauty but that was about it. Husband and I remembered this special aircraft in her heyday and never imagined one day we’d step on board – albeit not taking off. I remember once, years and years ago, sitting in a queue for take-off at Heathrow when the noise level increased dramatically and we realised we were about to see Concorde rise into the skies. Well impressed then, sad now we will never see that again, so this tour of the aircraft inside and out has to be the next best thing. It is hugely popular, advance booking is essential, we followed the advice and arrived in good time for our tour slot. Everything kicked off with a video about Concorde and all the facts and figures. There were about sixteen people of various ages on our tour, all very different and all proof that this is not just for aircraft aficionados. A brief talk by our tour guide then we headed into the huge hangar to get up close and personal with the star of the show. 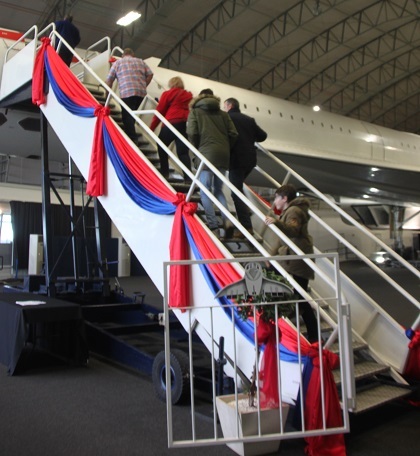 I felt a real sense of anticipation and excitement when I saw Concorde – she is a stunner, no doubt about that and it really was special to be climbing the steps to go on-board. We took a seat and listened while the guide told us more about the aircraft. I was instantly struck by how narrow things are inside – pretty obvious I suppose when you think about it, but the lack of space is striking. Just two, fairly small, seats either side and a very snug aisle, all intentional and to do with speed, they made everything as narrow as was absolutely possible while still maintaining comfort. 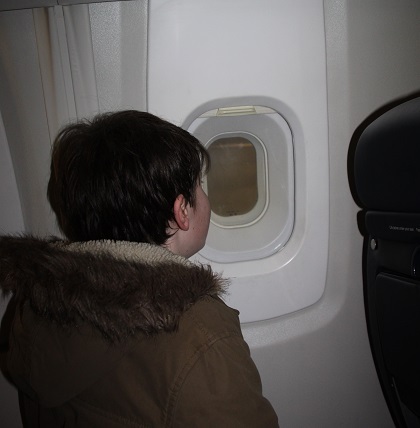 The legroom with each seat was pretty good though, Son was fascinated by the tiny windows. 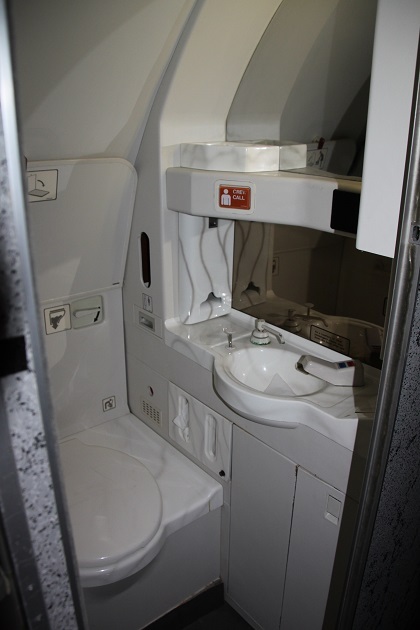 The bathrooms were nothing special either, but on board Concorde it was all about the service and that was what made this experience so special. Passengers were served the finest food accompanied by the finest champagne. The return fare to New York in 2003 when Concorde went out of service was £7,000. Business men loved it, they could easily travel from London to New York and back again all in one day. I would have loved it too, not least because the journey time was always three hours and twenty minutes, weather was never a factor and there was never EVER any turbulence – my idea of heaven. Head or tail winds didn’t feature as the plane flew so high above all of that – it doesn’t get better than that for me. The aircraft once went back and forwards across the Atlantic four times in one day. They could only go into supersonic mode away from land, apparently the pilots knew the exact point in the Bristol Channel and it was then the aircraft soared. The numbers flashed on a screen at the front and the passengers knew they were flying supersonic. After our talk we were taken into the cockpit in groups of four or less. Again such a narrow space, so many buttons and levers it was mind blowing. Son took the captain’s seat while I sat in the trainee pilot’s chair. Apparently this was the Queen Mother’s seat of choice when she used Concorde. Son got to push up the throttle and we listened enthralled as the guide told us how the aircraft expanded in flight. He showed us a photo of the captain’s hat fitting into a gap that Son could barely squeeze his little finger into. Our tour continued outside the plane. Lots of technical stuff about the engine and wheels which Husband found fascinating. I just enjoyed the sleek beauty and wonderful lines of the aircraft as we walked around and underneath before receiving our certificates to say we had been on board. Coffee in the cafe next door to warm up – that hangar was super cold, then we had a look around the Airport Runway Park. Surprisingly busy they have a number of other old aircraft you can climb on board and explore, this particular one with seats facing backwards and forwards over a table was our favourite. 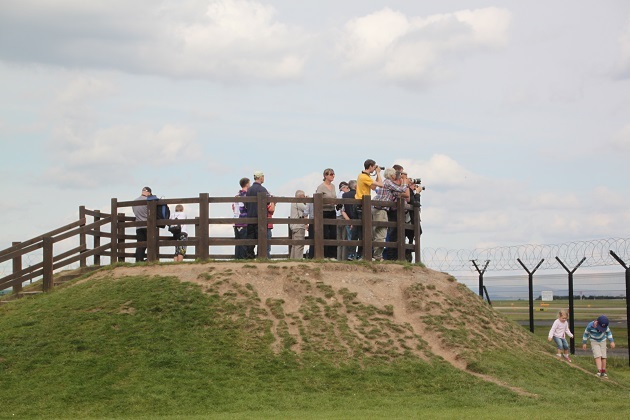 Three raised viewing mounds gave a clear view over the airfield – an unbeatable place to watch planes take off and land and a popular spot. We were amazed how many people were crowded there with cameras and recording equipment – the place to come if you are into planes for sure. It is a beauty that’s for sure. I used to work in Windsor in Berkshire and can remember that roar as it took off from Heathrow and over the town. I was only lucky enough to experience that roar a couple of times – incredible. There’s just something really special about this aircraft, I’m not into planes in the least and definitely not keen on flying but there’s something different about this one. You’re right. We used to live in Windsor and it flew over our garden every evening. We loved it. That must have been a great thing to see Margarita!! That was really cool! In no time in New York and wherever and back! And it looked good at the outside! That’s my kind of trip to New York Erika – fast and no turbulence!! It looks a really interesting tour to take, I’ll be looking into it! 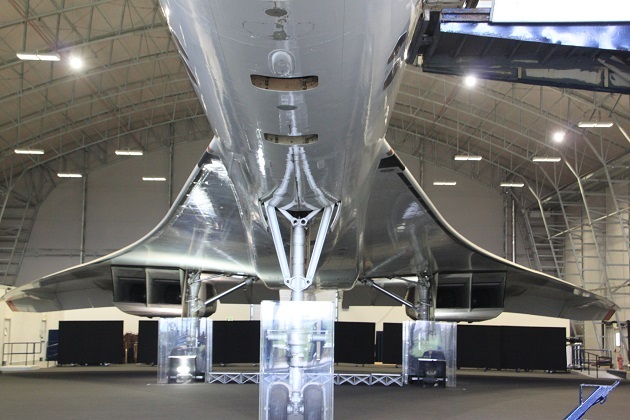 I thought it was fascinating – I’ve always found Concorde intriguing though so that helps!! It was great to climb up the steps and actually sit in the cabin and the cockpit too! I’ve always wanted to see the inside of the cockpit! Me too – it wasn’t disappointing!! What a fun thing to do ! I’d have loved flying with Concorde but sadly I’m too young to have had that experience! It sounded like an incredible trip – I would have loved the idea of getting to NYC in such a short time – without turbulence!! Didn’t know you could do that, thanks. Such a pity you can’t fly that fast any more, not that I ever spent that kind of money on a flight. 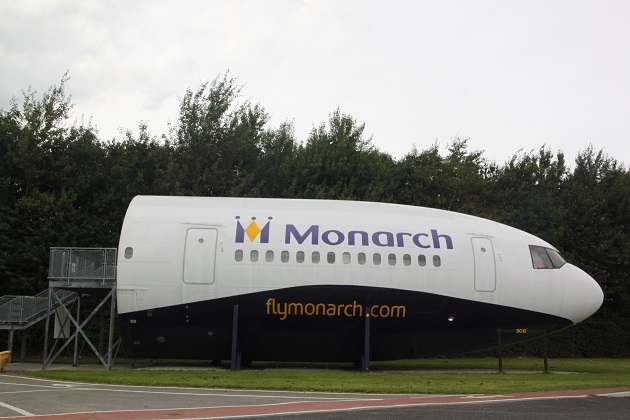 No, I don’t think it would have been within our price range but nice to dream… the tour was great though, a fascinating glimpse into a totally different way of flying, we loved it. I hate turbulence more than anything when I’m flying, my brain tells me to calm down but the rest of my body never listens. I never used to be like this, getting worse as I get older so the idea of never having to experience it again would definitely appeal to me Rosemary. It was such a good afternoon out, loved going inside Concorde and being in the cockpit, it was fascinating. I’ve always been intrigued by Concorde so it was wonderful to explore inside and out and hear all about his amazing aircraft, our guide had so many interesting tales to tell as well, it was definitely money well spent. 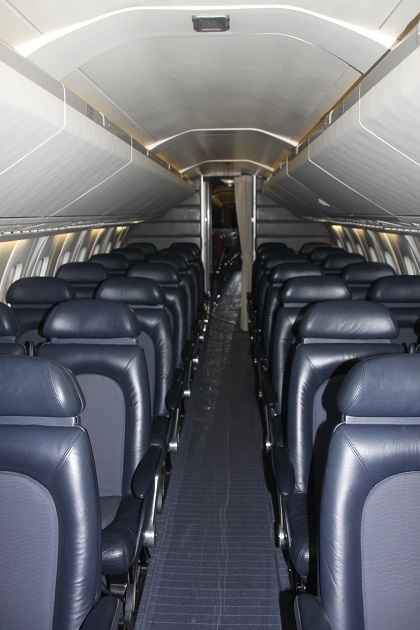 Thanks for sharing your inside look at the Concorde. Didn’t know about the lack of turbulence or tailwinds. I didn’t know that either – just made the sound of a trip on board even more appealing for me!! Thanks for setting the travel-blog bar high…that post was fascinating, detailed and had great pics. Keep on! If only I could fly Concorde from Australia to Europe – I would make the trip far more often!! It is the length of flight that makes me think twice. I know exactly what you mean and completely agree!! Apparently it was delicious – but I know where you’re coming from!! Getting from London to New York in that space of time would be the real appeal for me. Very interesting blog, I actually didn’t realise you could do this, something that would be exciting to look into in the near future, the cockpit looks incredible, kids must think they are in some sort of plane heaven! 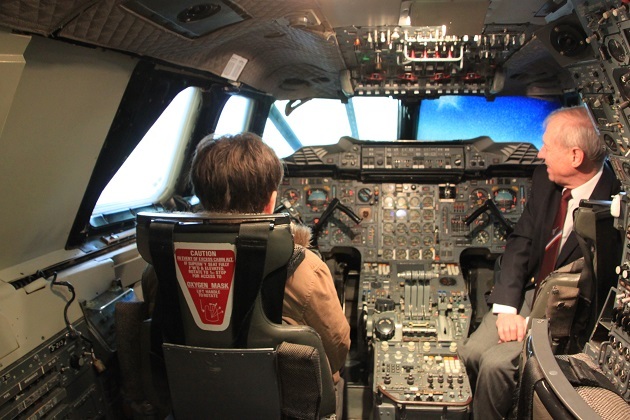 It’s fascinating – we loved the whole experience and our son couldn’t believe his luck climbing into the pilot’s seat. Great tour, but disheartening too. I’m disappointed that at this time in the 21st century Man hasn’t made this the norm for Elite, Middle Class, and Economy travel! I think it’s possible, but the profit margin must not be there for those who make the planes. They’re short sighted en mon avis! 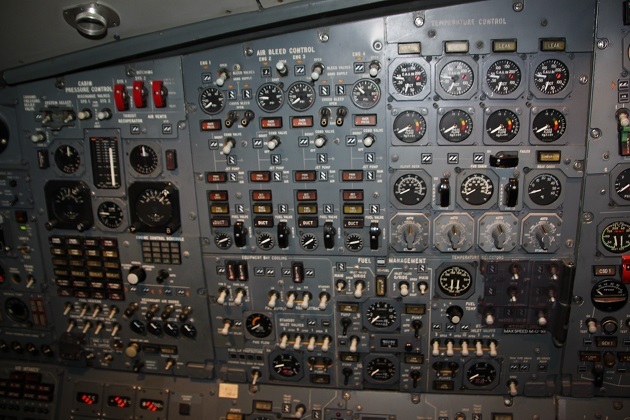 How I wish I was at a place in my life to have flown on the Concorde. Alas, I was very busy making babies, financing a home of my own, then supporting the babies, and home. No regrets, but wish I could have afforded a trip on the Concorde to the UK as well! Getting to the UK in 3+ hours is an incredible engineering feat! To do that routinely.. PHENOMENAL! That’s the stuff of Sci-Fi! I’m in! I hope we make a Concorde II and the have the petrol,and foresight that makes it more affordable to the Middle and Economy Classes, not just the rich and elites! If only they make it so…they will come! Branson and Virgin Airlines is the one I see doing it. He’a a pioneer, and made of the Special Stuff I think all inventors, and explorers are made of. My money is on him! I wish someone would do that – however our tour guide was of the opinion that supersonic travel was unlikely to ever happen again. All to do with costs and profit margins, the airlines prefer to pile them in and don’t want this high end luxury aircraft anymore. 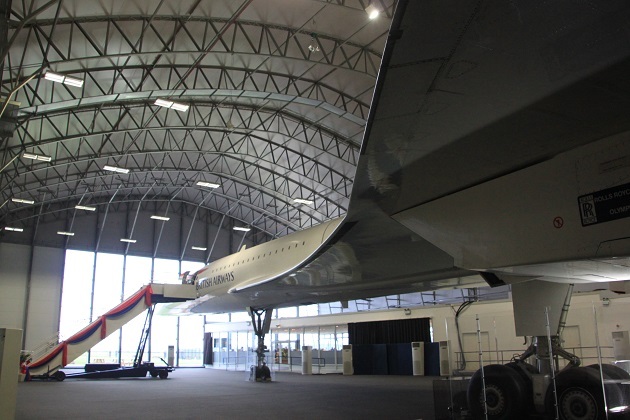 Such a shame…..
We walked through a Concorde once at the air museum near Cambridge (no tours, this sounds much better) and I was also surprised at how small and cramped it seemed. Makes sense though, as you say, it had to be because of the shape and the service would surely make up for it! The tour was fascinating, the guides were real Concorde fans too which always makes it more interesting. We heard so many great little titbits about Concorde too. Why did we give up on supersonic travel? I can’t remember what the issues were–it seems there would an ever-growing demand for it. This does look like a wonderful tour! It was fascinating, so interesting and such a great experience to climb on board too. There was a terrible accident with a Concorde which crashed in 2000, that combined with the 9/11 attacks hit the airline industry and Concorde was pulled from service. A real shame but our guide thought it unlikely there would ever be a supersonic offering again, airlines want to pile them in and offer cheap fares, they’re apparently not interested in this top end, luxury market and wouldn’t make enough money. As I said, a real shame!! It was – also incredibly interesting, it’s a marvellous aircraft. 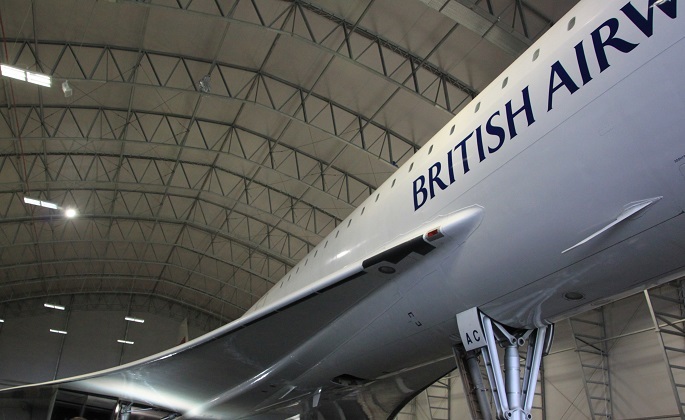 Great post – I had no idea Concorde tours were available. I remember as a child when we all trooped out into the playground to hear Concorde breaking the sound barrier. So sad this ‘plane was mothballed. Totally agree Susan, a great plane with something incredibly special, such a shame we’ll never see her fly again. What a great tour! I’m not a fan of flying but I’ve always been fascinated by planes and the Concorde. I didn’t know tours were available. Are they only in Europe? Great job on the facts and photos, Joy. They’re mostly in the UK I think George (the BA Concordes anyway) but I believe there is one in New York at the Intrepid Air Sea and Space Museum. It’s a beautiful plane if you ever get the chance to see her you should George. I haven’t been to the Intrepid in many years do I’ll have to check it out. Thank you. 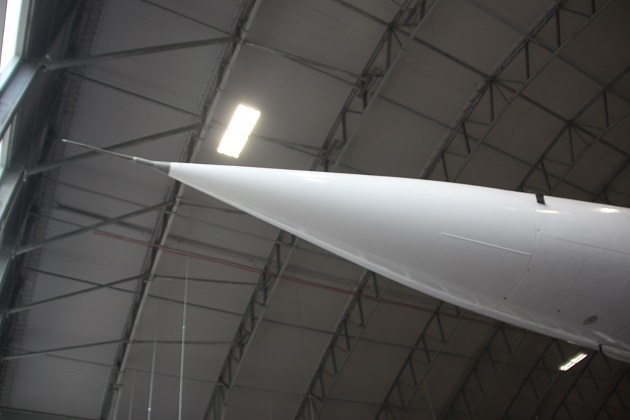 I did the tour many years ago when Concorde first came out, and was totally surprised at how small and narrow it was – especially for a six footer like me! That must have been a bit of a squeeze for you Denzil!! We were amazed too at how narrow the cabin was, worth it though to be able to cross the Atlantic in just over 3 hours I think!! For some reason, I imagined it to be a lot bigger inside too, more luxurious especially for the prices passengers had to fork out. Looks like a really fascinating trip. I think we’d love to do this – especially hubby. I’d like to say I’ve been on a concorde! Must make a note of this next time we’re up North! It’s a great tour, fascinating and to be able to sit on board Concorde (even if it doesn’t take off) is quite something I think!! Fascinating post, Joy. The Concorde has always been so intriguing in my mind, but like someone else mentioned, not that I’d ever have been able to afford it! Just as well to be able to see it :). That was exactly how we felt – we would never have been able to travel Concorde, this is the next best thing!! I can echo the sentiment of other people living in Australia, supersonic flight would be a huge gain for us! As I’ve got older I’ve developed flight sickness and the longer the flight the worse I feel! If we’re ever near this air field I’m sure we will visit. It’s exactly our cup of tea. Thanks for the great post. The older I get the more I dislike flying too – long flights are just the worst thing for me, and that’s from someone who loves to travel, I just don’t like the process of getting there. How amazing it would have been to travel supersonic in this great plane! It wasn’t too bad Pam in terms of feeling closed in – I’m not great with small spaces either but I do understand what you mean! It was a great experience to take a seat in Concorde and hear all about her in her heyday – luxury indeed!! 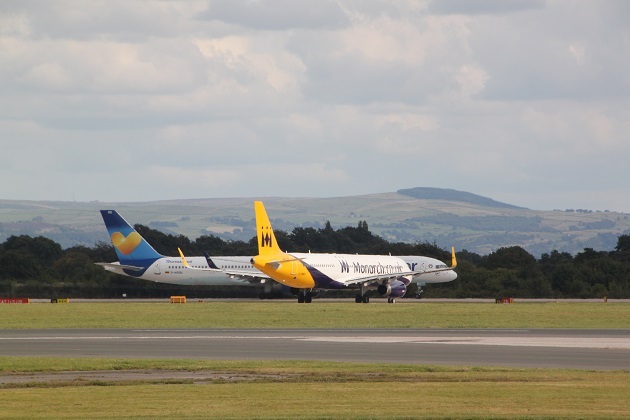 I worked at Manchester Airport for ten years (for BOAC /British Airways) and left in 1980 – what a change after viewing the links from your blog! I didn’t recognise the place. Wow that must have been a special day despite the lack of room!! Oh wow, it’s quite interesting to visit the cockpit ! I’ve never visit one. 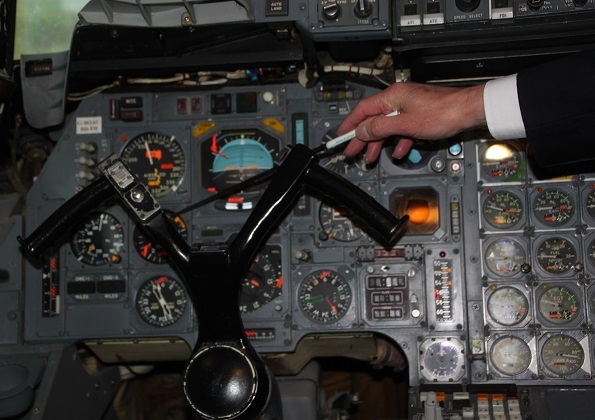 Mind blowing how many levers and buttons there were – also to be where the pilot sat was something special! I toured a Concorde once. I think it was in NYC. I could never afford the ticket. Did it really cost that much more to operate? How wonderful it would be if supersonic travel became the norm! 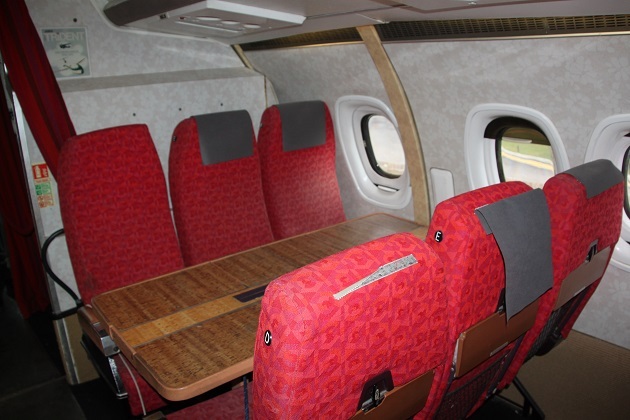 Out of our budget by a long way….. still visiting and sitting in the cabin has got to be the next best thing. Would absolutely love it if supersonic travel was available to all – my idea of wonderful. What a great post! Thanks for sharing about your visit! Thank you for dropping by and commenting!! We loved the tour and had such a great afternoon. Thanks for sharing, really interesting post! It’s a fascinating tour and a great day out! We’ve been wanting to do this tour for years now. I’ll have to book it soon as it does sound fascinating based on your review! 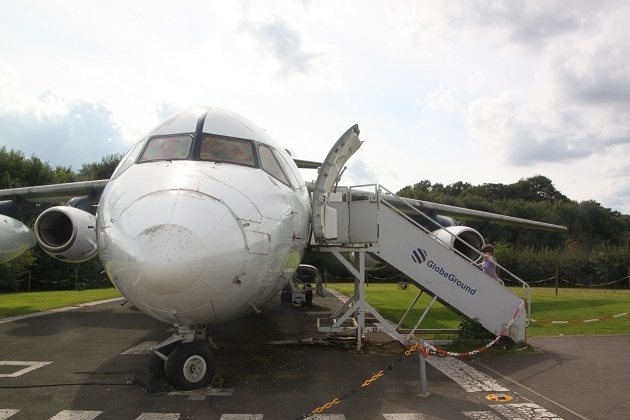 We loved it Becky, so interesting and sitting on Concorde – albeit not taking off was a great experience!! The Concorde was such a special aircraft. In 1996, I had the good fortune to lead a group on a chartered 28-day Around the World Tour by Concorde. I, too, was amazed at how small the interior was, but since the most we ever flew was less than 5 hours, it was bearable. We had the same crew the entire time — an amazing British Airways crew. When the Concorde was retired, I found a picture from the trip with the call letters visible. Thanks to the internet, I know the Concorde we flew on is now at the Intrepid Air & Space Museum in New York — I can’t wait to visit her one day! We just loved our tour of Concorde and the opportunity to just be inside the cabin and look around was fantastic. What an incredible experience though to go around the world on Concorde – sounds just incredible – you’ll have to visit the museum one day!! Always wanted to visit here and see Concorde in person. It’s top of my places to visit this year! It’s so interesting and being able to explore inside and sit in the pilot’s seat is so much fun. It sounds great, will definitely do that!